As much as I love spring, as soon as the temps start reaching around 75, my body thinks it's time to start swelling up! I watch the weather reports each night and just pray that there's another cold front still on its way. This year I will try to drink more water each day, since this helps your body release fluids (instead of retaining fluids from drinking so much pop and coffee). Being single makes things a LOT easier! I can't imagine having to fight over where the thermostat is set in the house or the car, but I still have to make compromises when the grandchildren visit or when traveling in someone else's vehicle. The first time one of my grandchildren complained that it was "too cold at Grandma's", I made sure I turned up the heat before they came over. Reminding everyone that you catch a cold from a VIRUS, not from cold air, doesn't help much if the kids go home with a runny nose! I've heard many stories from married people (even husbands write to me!) about the constant battles that go on when menopause becomes a part of their lives. They usually feel like their situation would make a great "Minnie Pauz" cartoon and they're usually right! One frustrated hubby told me how his wife drags a floor fan from room to room, (kind of like you would do if you had an IV attached) and at night has to have it blowing directly on her. Naturally, hubby has to dress warmly just to go to bed and then has to pile on several extra blankets. So it's not really ONLY the weather that affects our BODY temperature, but I would think that our meno-sisters in the South and other warm climates, have more difficulty staying cool than those of us in the North. For that reason, I am MORE than happy to be in Michigan and am thankful for the longer, colder winters. Of course, I keep my glee to myself because so-called "normal" people seem to think that if you say you like cold weather outloud, it will bring 6 more weeks of winter! I'm so glad I experienced living in Arizona, Texas and Florida in my younger years, because I sure couldn't take it now! I even lived in Saudi Arabia for two years!! 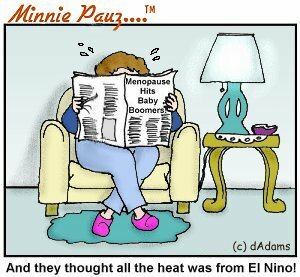 I will have to check with one of my friends who still lives there and find out if hot flashes are twice as bad in a hot, hot, hot place like that! I honestly don't think it is since the hot flashes actually come from inside our bodies. But cold weather seems to counteract the heat that radiates from the inside out during a hot flash. Get some of those gel-filled ice packs to use for a quick "cool-down"
If all else fails, let's all move to Durango, Colorado and start a menopause commune!